This isn’t, apparently, a groundbreaking review of a new product. From what I can see, this came out about last year or so. But I’ve only recently begun seeing it near me, so for my purposes, it’s new. And that’s what counts. I’m not going to get into the mythical properties of the Ice Cream Man. There’s too much to say on the topic, too much emotional gushing, and just too much nostalgia for me to properly do it justice in an introductory section. But I will briefly touch on my Ice Cream Man. My current, insane, Ice Cream Man. You will know he is in the area when you start to hear Christmas music in the summer. If you flag him down, you will see the wonderful assortment of products he has to offer – colorful product sheets stuck on the side of the truck. He will, however, not actually have any of these things for sale. If you ask for a Batman pop, he won’t have it. If you ask him for a dozen other things shown on the truck, those won’t be available, either. He will then say the five or so random bars he has on the truck – presumably, the things he found in his house’s freezer earlier that day. 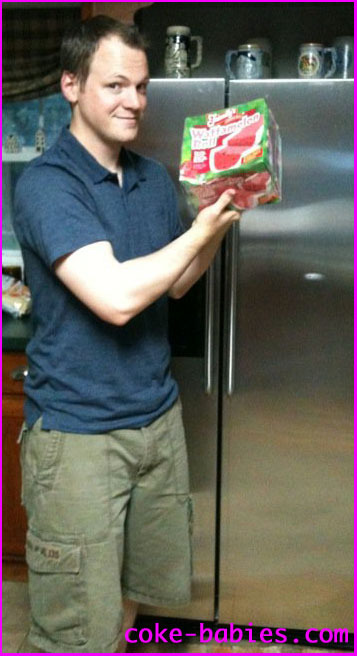 A few years back, he randomly had one thing that looked good – a Watermelon Bomb Pop. 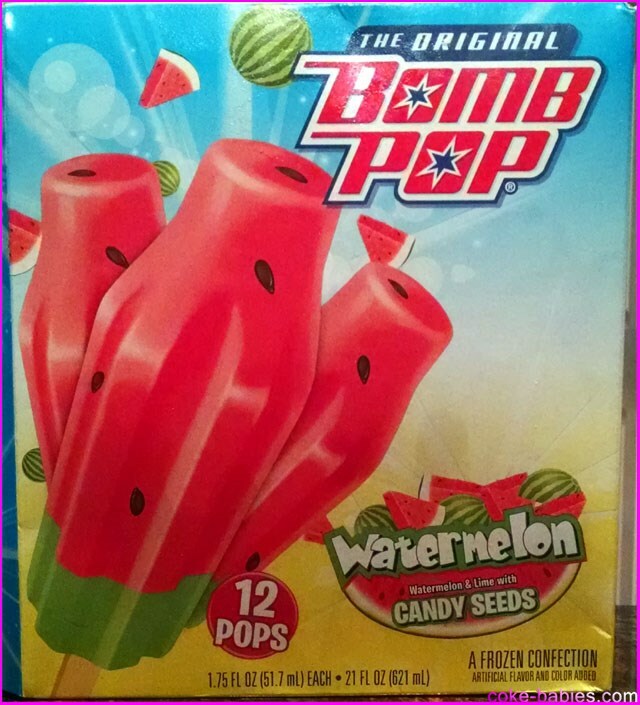 This intrigued me, since Bomb Pops are awesome, watermelon flavoring is awesome, and it looked like a pop-shaped version of a Wattamelon Roll. I will not delve into the sadness of my Wattamelon Roll absence, as it has been covered before. But still, I am sad. All the time. The Bomb Pop turned out to be awesome, and I looked forward to the Ice Cream Man coming back around, to purchase a bunch more. However, he never had any more for sale. Instead, I was probably offered a Target-brand Chocolate Eclair or peanut butter Frosty Paws. I contacted Blue Bunny back in 2012, but was told that this product could only be purchased through vendors, and couldn’t be bought directly, and was not available in stores. Then, a few weeks back, I saw the retail version in stores, and was joyous. Bomb Pops now come in a few varieties, but those other varieties don’t matter because what’s important is that Watermelon is sold in stores. One big difference between the Bomb Pop and the Wattamelon Roll is that the Bomb Pop is dairy free. The pop isn’t sherbet, and the chips aren’t chocolate. The chips are this weird, compressed blackness, made up basically of oil and sugar. They don’t really taste like anything, but it’s okay. The chips give some bite to the pop, and makes it look more like watermelon. 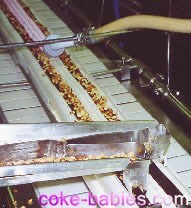 So I don’t particularly care what sort of witchcraft and chemicals went into making them. I don’t want to insult either company with my comparisons. As is well known, Wattamelon Rolls are literally the greatest creation in mankind’s history. So the Bomb Pops have a lot to live up to. I make the comparisons to show that the Bomb Pops prove to be a worthy substitute, since I can’t buy the Friendly’s goodness. 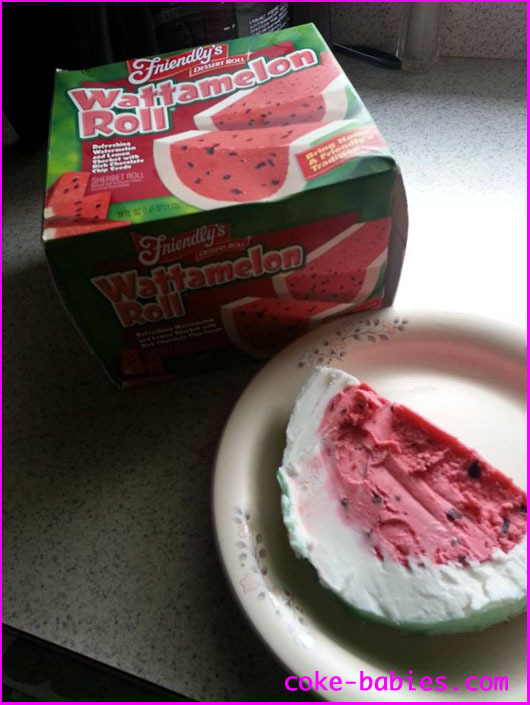 Or, to put it in a classier way – the Watermelon Bomb Pops are the methadone for my Wattamelon Roll withdrawals. Just slightly less effective. So go out and buy these – they’re awesome. This is a tale that almost has it all – sadness, triumph, and betrayal. The one thing it is missing is a victorious ending. Growing up on Long Island, there were three main places to get ice cream: Carvel, Friendly’s, or some other place that wasn’t Carvel or Friendly’s. 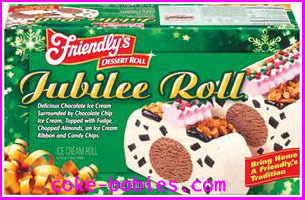 Friendly’s eventually rose to the top for me, on the strength of their ice cream rolls, most notably their Jubilee Roll. 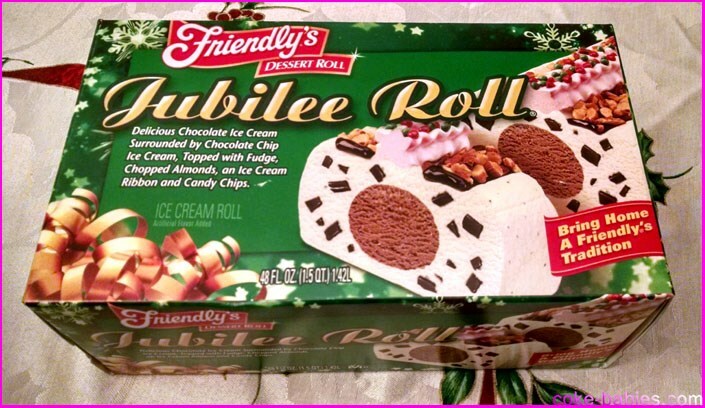 The Jubilee Roll was a Christmas tradition with my family. It’s one of those “this isn’t very interesting to read about if you didn’t grow up with it” situations, so I will be brief. But basically, to a kid, that pink part on top was worth twice its weight in gold. It caused many a fight between my sister and me. As much love as I had for the Jubilee Roll, it became a distant second once I found my true love – Wattamelon Rolls. Wattamelon Rolls are, literally, one of the greatest things mankind has ever created. 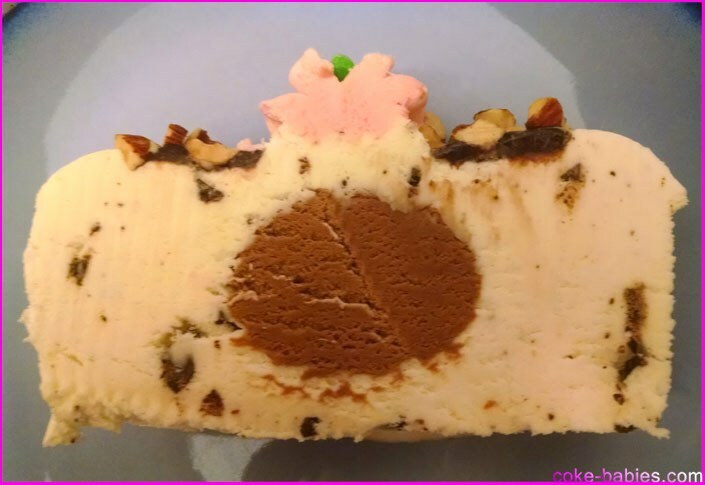 It is a sherbet roll shaped like half of a watermelon, with watermelon sherbet and chocolate chips making up the fruit, and lemon sherbet making up the rind. While that description makes it sound good, it doesn’t nearly do proper justice to the glory that is the Wattamelon Roll. I need to learn one of those languages that has more letters than English, in hopes that having extra letters to work with might help explain how good it is. Some people look forward to summer because of the warm weather, being off from school, traveling, or some other less-important reason. 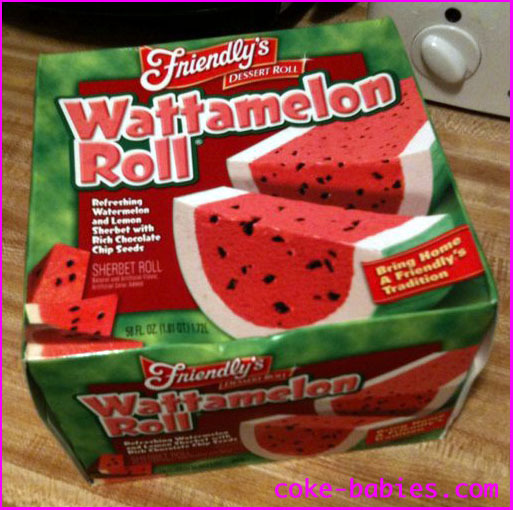 I looked forward to summer because that’s when the Wattamelon Rolls would be stocked. 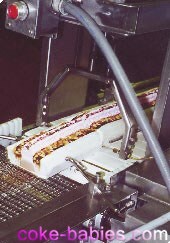 Summertime became a race against the clock to ingest as much as possible, until the sad day came when they were taken off store shelves until next year. If only I had known that “only available in the summer” would soon become the least of my problems. After moving from New York to Colorado Springs, I came to the depressing realization that Friendly’s doesn’t have a location west of Ohio. I was scrambling for ways to get my fix. Could I have a friend ship them overnight? It would be expensive as hell, but maybe if I got four or five in one container, that would at least last me a week or so. Finally, I went to the source – I emailed Friendly’s. I sent them a long, impassioned message about how important Wattamelon Rolls were to me, and the lack of them where I live was causing my soul to decay. I said if necessary, in case they have some sort of shipping minimum, that I would buy an entire pallet of them. Sure, it would cost a lot of money, and I’d have to figure out where to put them, but I’d make it work if it came down to that. After pouring my heart out, my only reply was the remarkably un-friendly, “Friendly’s does not ship its products.” No “sorry for your loss”, or “thanks for your feedback” or any token gesture of sympathy. Just a terse rebuttal that destroyed my day. Apparently, my dad had stumbled upon them in Walmart. They were stocking them with the ice cream cakes. I bounded down the stairs, with a gigantic smile on my face, to show my wife. She knew all about my trials and tribulations, and I knew she would share in my happiness. While I think much of her shared joy was largely pity and some shame at my levels of excitement, she at least patronized me. An hour or so later, we were off to my parents’ house. My dad had bought two of them, but decided to put them in his cart at the start of his shopping trip, so they were quite melted, even after being in the freezer for a couple of hours. While it wasn’t ideal, it was good enough for me. Half eating, half drinking it, I was in heaven. Not literally, obviously. Although if that’s what heaven turns out to be, I don’t think I’d complain. So, that summer was a wonderful one. I was paranoid that the Walmarts around me would sell out, so I made sure to always have my freezer stocked. 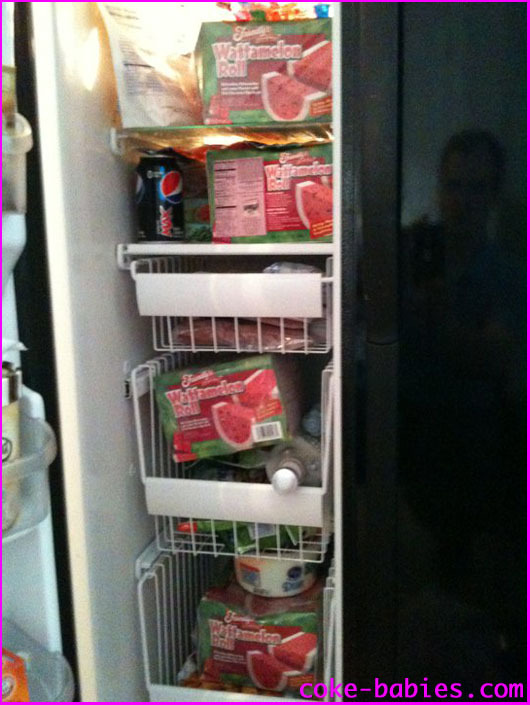 And, lest you think I am a weirdo, I will point out that I don’t store sodas in the freezer. That can is filled with frozen fat. Of course, the summer had to come to an end, so I knew that the Wattamelon Rolls would go back to being shelved until next year. Well, I guess not “shelved” so much as “not made for another 8 months”. But if they just put the existing stock into deep freeze and sold them a year later, I’d still buy them. Come May of next year, I began to be on the lookout for them. I didn’t see them, and figured maybe June was when they’d hit stores. Halfway into June, I was getting nervous. By the end of June, it became depressingly clear – it didn’t seem like Walmart wanted to be my friend anymore. I contacted Friendly’s and Walmart about this debacle. While they weren’t helpful, Friendly’s put the blame on Walmart, claiming Walmart decided not to carry their products this year. With Walmart landing in the defendant’s chair, it became time to take the efforts towards them. My requests on Facebook, email, “Contact Us” forms, even phones became something akin to carpet bombing. I assumed they would ignore me because, well, that’s what Walmart usually does. So I figured even if they wouldn’t listen to me, I could maybe annoy them into action. I may have to look into the old idea of having someone ship me some. I will not give up on my efforts. Even if nothing ever happens between Friendly’s and Walmart, I can at least know I didn’t sit back and allow my misery to grow without a fight. It’s an incredibly stupid decision by Walmart, since I was literally buying almost all of their stock in my city. There’s five Walmarts within a thirty minute radius of me, and among all of them, they had maybe two left on the shelves after I bought all of mine. They sure sold a lot better than the trash they keep in their ice cream cake freezer now. And Wattamelon Rolls are light years better than anything in there. 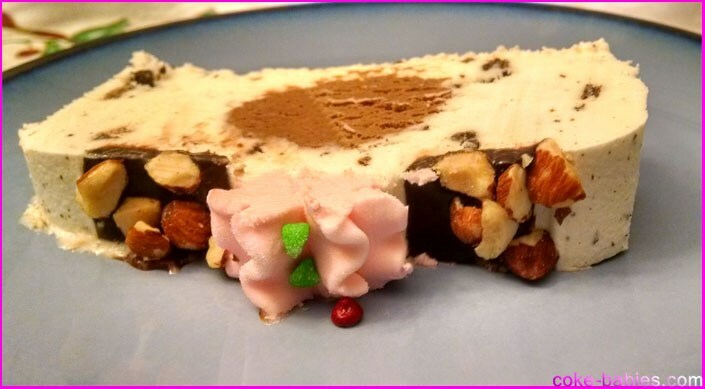 Have you had one of those M&M ice cream cakes? Dire stuff. So in the off chance someone from Walmart is reading this, or even Friendly’s – make this relationship work again! As in every divorce, the true victims are the children. Or the thirty somethings who just love eating like children.